Add this item to your shopping cart to earn 110 points fidélité. Use to save 1,10€ on your next order. An efficient and economical lighting solution !!! 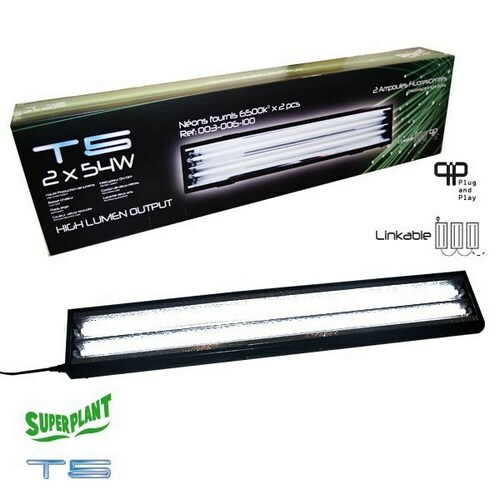 The T5 SuperPlant ramp equipped with its 2 24 watt 54 W Growth (6400 ° K) is a light source dedicated to germination, cuttings and early growth. The true innovation of this SuperPlant product is that it is possible by simply connecting (IEC socket available as an option) to connect several T5 linkable between them and thus to use one and the same power cable. Optimum illuminated surface: half a square meter or 100 x 100 cm. Warranty: 1 year.